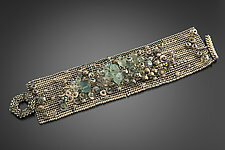 "I am interested in creating a kind of fabric using glass beads with a needle and thread. 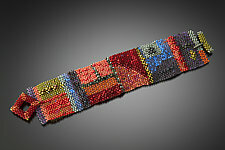 The myriad colors and surfaces of seed beads and stones play upon each other in endless combinations and moods." 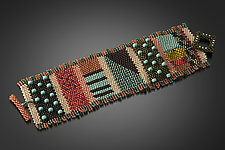 Julie Powell came to beadwork by way of woven, knitted, and embroidered fabrics. 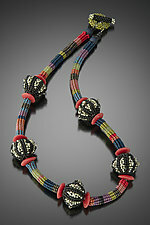 She is drawn to the interplay of color and texture fashioned into the small forms of cuffs and necklaces. 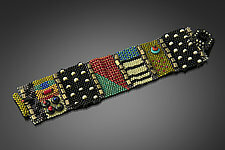 While enchanted by beads of all kinds, Julie focuses primarily on glass seed beads and natural stones. All work is done bead by bead with a needle and thread. Though extremely intricate, the medium is flexible and forgiving. Each piece is an engineering puzzle, sparking ideas for new pieces with every stitch. 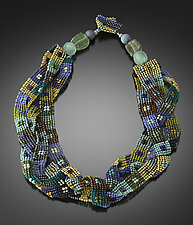 Each piece begins with a bead soup of delicious elements of color and texture. Combinations are chosen to evoke a color story: a Turkish rug, a sunset in the Southwest, a tidal pool, a Chinese red lacquer box. At times, a piece is centered around a focal gemstone or a piece of glass. Other times, the design evolves through repeated components and elements, like a quilt. 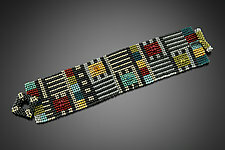 Each bead is threaded one by one in embroidery or peyote stitch in a linear format, a grid, or a rambling sculptural form. The finished pieces are light yet strong and structurally sound. Julie Powell is a self-taught bead artist. She has developed her techniques through many hours of practice and experimentation.